Generally simpler than similar offerings from other boatbuilders, Nomads have always delivered the goods as fishing boats without the unnecessary frills sometimes affecting other brands. Our test boat was a 4.8m Nomad "479" side-console with a full-depth cockpit instead of an aft casting deck – ideal for those who fish rougher open water as much as the calm. Those who spend more time lure-casting on calm water would probably prefer the raised deck aft option. 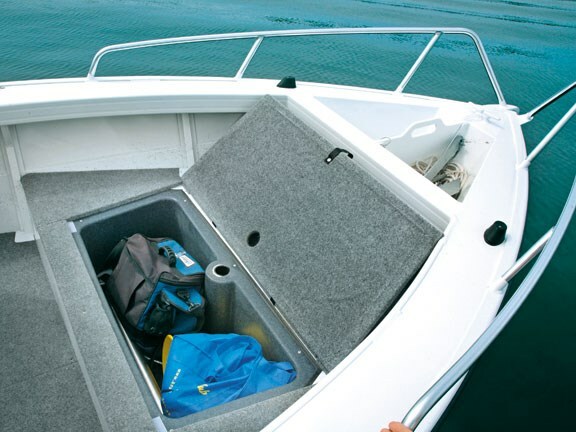 The new transom consumes minimal interior space while still providing stowage for items like batteries. 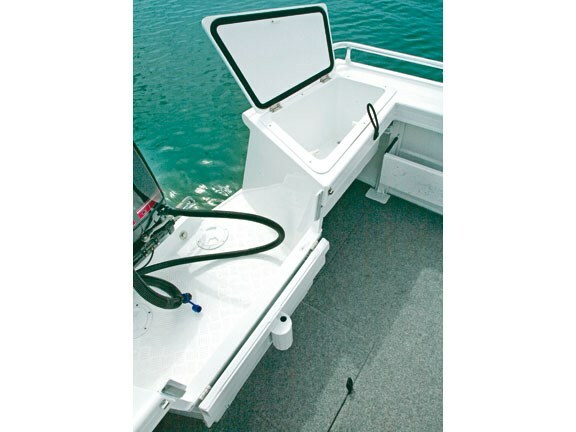 It also has room for a decent-size livebait tank in the port side of the transom covering-board. There’s still enough flat checkerplate around the outboard to make it pretty easy to climb aboard over the back. The centre-section of the aft bulkhead, right in front of the outboard, is cleverly hinged so it can fold down or tilt up. The latest generation of Stacer’s stretch-formed hull is called "EVO Advance". This hull has new bows with a finer rake compared to previous versions. Although not that subtle when you take a close look, the change in ride quality is dramatic. These new bows are not as fine in that critical area where the bows slice through surface chop, nor do they have flare above the chines, however, I’m happy to observe that these new Stacer bows easily place them in a league of their own, well beyond the average aluminium hull. Inside the 479 Nomad, the side-console allows an icebox or tacklebox to be stowed behind the rise of the casting deck at the driver’s feet. Beside the helm are two sockets in the deck for mounting a passenger seat. 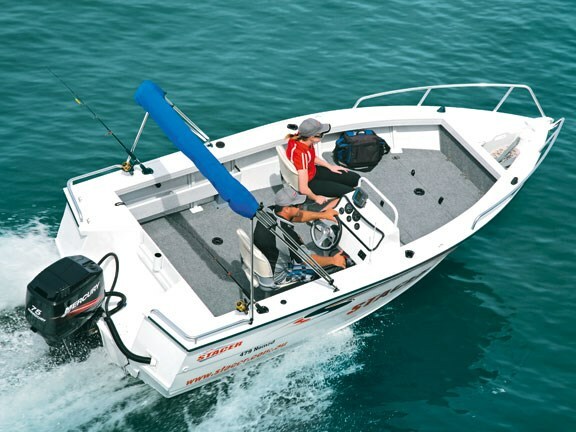 It allows the passenger to be moved forward or aft to help trim the boat laterally , and whether you wish to shift weight forward or aft to suit sea conditions. On the bow casting deck is yet another seat-mount socket, and space underneath is fully utilised as stowage. At the aft end there’s a big lined compartment with a pair of underdeck lockers between it and the bow bulkhead. These go all the way to the inside of the hull. Up on the foredeck the anchorwell featured a new drop-in divider. I can see it serving as a cutting and cleaning board, or as something to divide the anchorwell into two sections. The livebait tank has a Teflon cutting-surface as a lid. 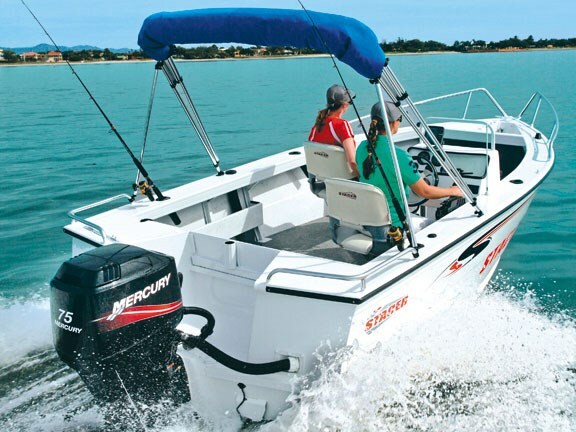 The standard bimini top shades the helm and passenger seats, but can be stowed away. As an alternative the bimini can be laid down flat across the transom, or even removed altogether with the aid of a screwdriver. Along each side of the cockpit is a big sidepocket that’ll swallow a fair amount of odds and ends, but don’t interfere with leg support when fishing. Out on the water it soon became apparent that this boat was meant to be driven while seated at the wheel. Standing up puts the wheel at a low and awkward angle. The Nomad was an easy to handle and fun boat. It would be equally comfortable on long runs to fishing spots, as it would on family and social outings. 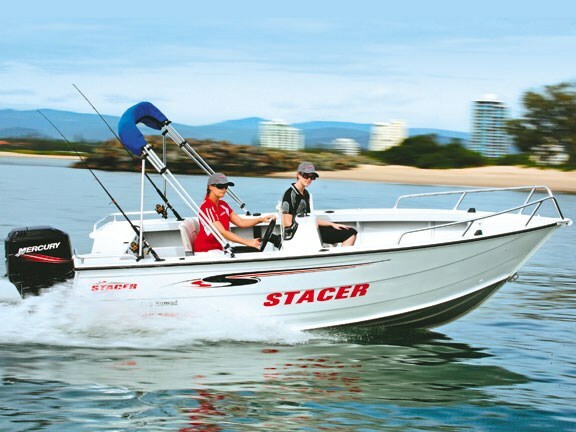 Our test boat was powered by a 75hp Mercury two-stroke outboard with an 18in pitch Vengeance propeller, an optional upgrade from the standard 60hp two-stroke Merc. While this engine is more expensive, the 75 provided sufficiently brisk performance to drag kids about on wake toys, if that’s a requirement. It allowed the 479 Nomad to cruise effortlessly, and I should imagine economically, at 18-20kts at between 3500-4000rpm. Flat out the GPS recorded a top speed of 34.7kts (64.3kmh) at 5800rpm while lightly loaded.